Evonik Stockhausen GmbH's acrylic acid plant in Marl has been operational since 1991 and currently consists of three production lines with a total capacity of approximately 200,000 tons per year. Acrylic acid is primarily used as a raw material for superabsorbent polymers, which are used to produce disposable diapers, among other things. The plant had already been fitted with a Yokogawa control system in 1999. In 2005, this ever-expanding plant was also fitted with Advanced Alarm Administrator, an intelligent alarm management system from Yokogawa. Plant start-up, load changes, and other operational changes are complex, challenging processes that require experienced operators. Given the substantial commercial importance of this plant, initiatives to standardize operational procedures and automate its processes make complete sense. Exapilot is Yokogawa's solution to this challenge. This story describes how Evonik implemented the Exapilot solution at this large-scale acrylic acid plant and presents key outcomes and experiences. Evonik purchased the Exapilot package and connected it to the CENTUM DCS via an OPC interface. (Exapilot can be connected to any Control System via OPC.) A core feature of the software package is a symbol-oriented command language. This makes it possible to assemble clear and easy to understand flowcharts of operational procedures for complex operations in order to automate a process. To optimally configure such processes using Exapilot, data on the plant configuration and the process as well as input from experienced operators is required. 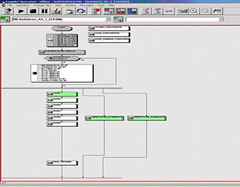 During start-up, for example, logical information and parameter lists are loaded and processed step by step. The status of the procedure is indicated with a color code. At the same time, an ActiveX notification window provides the operator important information on the process and actions to be taken. During the second half of the project, initial testing of Exapilot was carried out by using it to execute a cascade sequence start-up of a distillation column. The first results were promising. It quickly became possible to minimize temporal variations during start-up and reduce the average start-up time by 30%. The column therefore reached full-load operation more quickly and reliable. When starting the complete cascade sequence, up to 90% less off-spec product could be achieved. 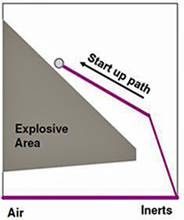 An additional advantage is that individual start-up processes overlap, which further accelerates the overall process. Following this successful test Exapilot was implemented for the plant's first distillation column, and subsequently for all other columns. At the same time, the reactors where the oxidation reaction takes place were also included. The start-up of the catalyst-filled pipe reactors is particularly challenging as roughly half a dozen parameters are monitored systematically and gradually need to be adjusted in order to obtain the optimal temperature profile. On top of that, some parameters are partly dependent upon each other, individual control circuits react at different speeds, and safety-related parameters such as explosion limits depend on load. Especially here, Exapilot's strengths come forward. In total, the system tests approximately 600 important parameters and replaces more than 400 manual procedures during the start-up process. As the system requires numerous incremental changes to the parameters, Exapilot is more suited to carrying out the sensitive adjustments than manual interventions. At the same time, the system enables the user to use his/her experience to select the optimum route within the set parameters to provide additional commercial benefits. 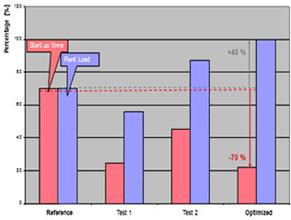 When controlled manually, an optimization task can be carried out on the basis of intuition. Exapilot, however, constantly observes all the key parameters such as the peak temperature and its geometric position in the reactor, the safety margin towards a potentially explosive atmosphere, and also the concentration of the reactants and the cooling capacity. Also here, already after the first test, Exapilot showed its value. 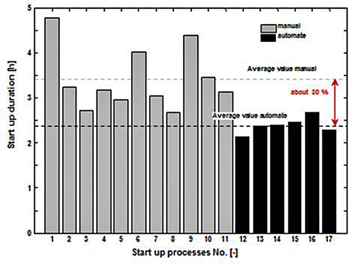 Average start-up times were reduced, in some cases by more than two thirds, as shown in the graph below. The fact that a manual start-up process can be very time-consuming highlights the relevance of this improvement. What is more, the process is considerably quieter, i.e. without large fluctuations in temperature. Dr. Mosler production manager summarizes, "Exapilot is an efficient and sustainable solution and has fulfilled all of our expectations. We have seen a return on investment in less than a year." At the same time, he stresses that the system cannot be used as an "autopilot" and will not substitute an experienced, vigilant operator. But he explains, "It does however enable the operator to spend more time on 'intelligent' tasks, in addition to observing the constant or step-by-step changes to these parameters. "Exapilot is particularly useful in processes that are not part of standard operations and need to be partially automated in accordance with best practice. Even for less experienced operators, Exapilot achieves consistent performance. In addition to reducing operator workload, Exapilot presents three key economic advantages – It saves time (increased plant availability), reduces the required quantity of raw materials, and, last but not least, reduces the amount of waste. 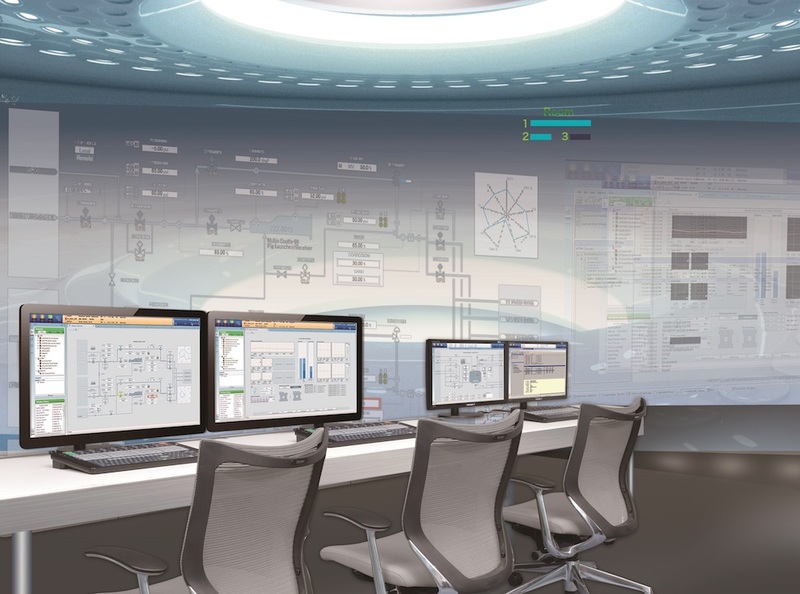 Yokogawa Distributed Control Systems (DCS) deliver the industry's highest proven availability, maximizing performance and profitability.